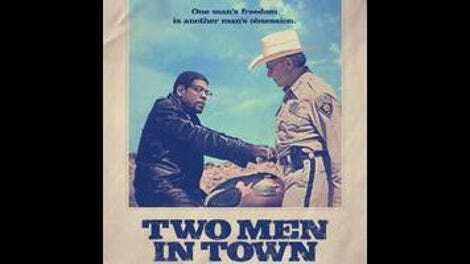 French director Rachid Bouchareb’s career-long preoccupation with conflicting cultural values gets one of its more enigmatic workouts in Two Men In Town, a minimalist remake of the not-quite-classic crime flick of the same title. 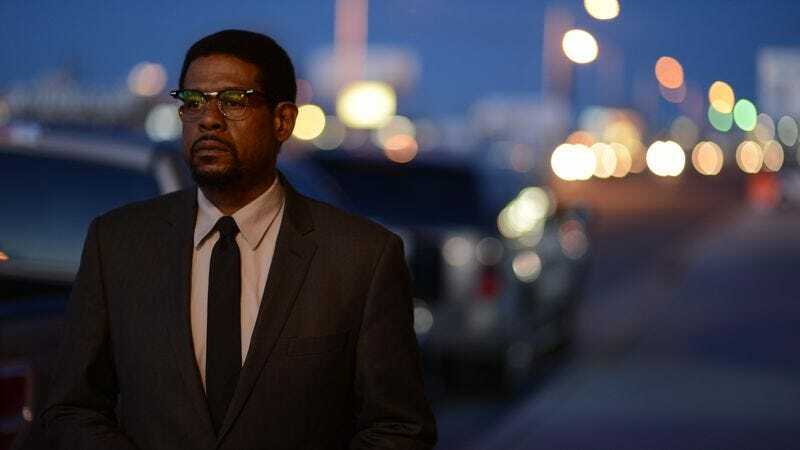 Paroled after serving 18 years for murder, former drug dealer Garnett (Forest Whitaker) emerges into the desert air with little more than a charity suit, a prayer rug, and a pair of browline glasses to his name. Having converted to Islam in prison, he’s set on starting a new life. He gets a job, he buys a motorcycle, he takes his bank teller out on a date—and everywhere he goes, he’s dogged by the local five-term sheriff (Harvey Keitel), who doesn’t believe for a second that the man who killed one of his deputies two decades ago won’t slip right back into his old ways if given the chance. Bouchareb (Outside The Law) has produced all of Bruno Dumont’s work, and he enlisted the other filmmaker’s regular cinematographer, Yves Cape, for this project. In many ways, it feels more like an American Bruno Dumont movie than Dumont’s own Twentynine Palms; it’s composed around flat, exurban landscapes—the southern edge of New Mexico, in this case—and colored by the idea that tightly knit communities define themselves by how they internalize violence. And though it’s Bouchareb’s third U.S.-set feature, the movie retains an outsider’s taste for regional authenticity; short of John Sayles, it’s hard to think of an American director who’d handle characters switching from English to Spanish so matter of factly. Even if the accents are questionable or inconsistent, there’s still a sense of place and geography that’s rare in contemporary American film. This is the county-sized world of a parolee, where everything seems small except the horizon. Bouchareb has always been better at managing conflicts and contradictions than at resolving them; Two Men In Town is par for the course, a bundle of themes without much in the way of a meaningful conclusion. The original—directed by the notorious José Giovanni, a prolific novelist and screenwriter whose past as an extortionist and murderer only came to light in the 1990s—was a pulp drama with a right-wing individualist angle. Bouchareb retains the central conflict, but complicates it by making the protagonist a murderer rather than a thief, adding religion into the mix, and turning the cop into a sympathetic figure, a no-nonsense lawman who’s introduced chewing out a band of Minuteman-type border vigilantes. The result is a movie of complicated interpersonal and cross-cultural tensions: between Sheriff Agati (Keitel) and hard-working new-in-town parole officer Smith (Brenda Blethyn); between Garnett and the former partner (Luis Guzmán) who wants him back; between Garnett’s past and the life he wants to make with his Catholic girlfriend, Teresa (Dolores Heredia); between the violent person Garnett was and the upstanding Muslim he wants to be. These tensions never come to a boil, instead remaining at a perpetual simmer.